At an internal government meeting last week President Ramzan Kadyrov delivered a statement which by no stretch of the imagination can be called sensational. On the contrary, in this instance the considerations of the Chechen politician seem perfectly reasonable. He does not want to see in the republic combined detachments of police from the various regions of Russia, forces that do constant service in Chechnya on a rotational basis. As Kadyrov quite rightly points out, these groups fulfil little purpose: for the most part they are engaged to protect the locations where they are deployed, such as police departments of various kinds, or stationary checkpoints. Kadyrov intends to ask Russia’s Interior Ministry not to send any more federal police to the republic, since the units of FSB and Interior Ministry troops are more than enough to deal with military and policing tasks. To complete the picture, the Chechen President gave a brief outline sketch of the checkpoints which for some unknown reason continue to exist on the Kavkaz federal highway, intimidating people and preventing the movement of traffic and freight. This concluding passage in the statement is of interest, as it provides a complete rationale for Kadyrov’s desire to get rid of the "stray" police units. The problem is that the remaining checkpoints, which "outwardly resemble fortresses", "surrounded by barbed wire and minefields”, continue to mark Chechnya out as a territory of war, outside the current Chechen leadership’s full control. The government has to share its power over Chechnya’s roads with obscure units whose fighting ability is close to absolute zero. At the same time, though, Kadyrov is quite willing to put up with those forces that are engaged in special operations against the insurgents. He is not demanding their withdrawal, and one can understand why. 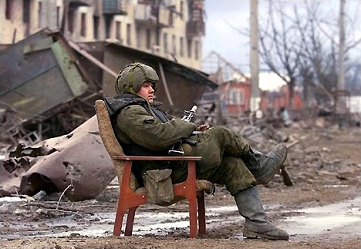 Few people in Chechnya are in much doubt that it is Russia's units, based permanently in the republic, that do all the dirty work of finding and eliminating the "forest brethren". The valour of Kadyrov's police may well vie with the courage and skills of their colleagues from the combined units. From the point of view of a local leader who, in the land he considers his own, must for some unknown reason endure the presence of numerous groups of foreign guardians of order who bring him not the slightest benefit, Kadyrov is right. And on the whole the leadership of Russia’s Interior Ministry, with whom the head of Chechnya intends to lodge his appeal, would be bound to acknowledge that his arguments deserve attention. But will it do so? That is a complex question. Let us venture to suppose that the situation regarding the combined forces may not be as clear-cut as it seems. Sent to Chechnya at some point in the past, these forces took part in battles and “mop-ups”, and were at the disposal of the army and special forces. Now, if Kadyrov’s statement is to be believed, they will no longer be called on to perform such tasks. Does this simply mean that a system which was needed in the past, but has now lost its purpose, still operates in the republic primarily because the men who were drafted in from outside do not want to see it discontinued? They are, after all, fighting men: issues of seniority and promotion, and quite possibly some other "Chechen" privileges, may be at stake. For this reason it may be hard for Kadyrov to cope with this grouping, which exists largely on kickbacks and freebies from Russia’s Interior Ministry. There is, however, another hypothesis, one that rests – let us not be shy about it – on conspiracy theory. The vast majority of the privates and officers in Russia’s Interior Ministry forces have passed through Chechnya. Many experts tend to see this as an explanation for the fact that the last few years have seen a dramatic increase in the number of rapists, sadists and murderers among the Russian forces. But in the context of the conspiracy theory this is merely a side effect, one that cannot be avoided if one wishes to have on reserve a supply of "Tonton macoutes" who may have to be used against the civilian population. Where is the best school for the training of such personnel to be found? In Chechnya, of course. Because it is here that Russia's police come face to face with the hostility of an entire population and learn to see that population as a total and permanent enemy. And then, by virtue of the neurosis that has been implanted in them, they gain the ability to transfer the matrix of "pure" hatred onto any population, anywhere. This is conspiracy theory of the purest water. No one has ever formulated the task of training the young police cub in these terms. The task has, however, been formulated in other terms. A Russian general giving his approval for forces to be sent to the republic a year in advance, is likely to mutter the hoary old maxim: "Let the lads go. It will make them stronger.” The plan is the same, but less formalized.